The nativity story that inspired Christmas has been told and retold in various mediums and media, including children’s books, animated specials, and live-action feature films. Now, Sony Pictures Animation and director Timothy Reckart presents a new spin to the classic Nativity Story with the animated film The Star. Does this movie weave a new thread in this old tale or is it a far cry from its religious source material? For showtimes and more, check out The Star on movietimes.com. One cause for concern was how the movie would try to balance between trying to appeal to kids as an animated feature and trying to evoke the story of the Jesus’s birth at the same time. Luckily, for the most part, Reckart does a solid job in trying to find a balance between the two. The Star never gets too preachy or bogged down in historical religious accuracy (this movie is about a variety of animals being the “unsung” heroes to the Nativity of Jesus), but also keeps the main narrative focus of the birth of Jesus on the straight and narrow path; rarely going off on side-story tangents. Thus, while taking liberties with its source material, is still respectful of it and keeps the animated tale light, fun, and full of charming. In terms of animation, The Star has a unique design to it that seems a bit lower than your standard animated movie features nowadays. The film’s animation is good (and works well), but can’t outmatch animation from the likes of Moana, Cars 3 or Despicable Me 3. That being said, it’s still pleasing to the eye as there are far worse animated movies (design-wise). Also, the film, which has a runtime of only 86-minute long, keeps everything moving at a brisk pace and has the jokes / gags coming out fast, which is fine for a kid’s feature. Lastly, being a religious movie, it does have some messages for individuals to take away, including God’s plan is always good (despite the fact they’re not always easy) and that redemption can be found within the most unlikely / unforgivable beings. Another positive is with its music. While its score, composed by John Paesano, hits all the right melodies and notes for a kid’s animated movie, the film’s musical soundtrack is populated with recognizable / classic Christmas songs that have been re-recorded by some today’s current new / popular artist. This list includes Pentatonix singing “Carol of the Bells”, Jake Owen singing “What Child is This?”, Yolanda Adams singing “O Holy Night”, Saving Forever singing “What Christmas Means to Me”, and several others from other artist like Mariah Carey, Fifth Harmony, Casting Crowns, and Kirk Franklin. The inclusion of famed Christmas song adds a fun and musical feeling to The Star’s overall appeal, making the feature “pop” every now and again with these songs come on. There are some problems within this movie, which keep this from being truly iconic and memorable in its undertaking. Perhaps the most notably one is in its target audience. As stated above, The Star is a kid-friendly religious movie about the advent birth / nativity of Jesus Christ. This means that the movie’s targeted viewing demographic is mostly those of the Christian faith, alienating viewers of other beliefs. Also, the film itself is a bit of a head scratcher at some points, especially when it’s trying to convey certain of its concepts using animals. For a film that’s rated PG, there are a few moments that will have you scratching your head and saying “this is in a kid’s movie?”. Coinciding with that is the film’s humor, while bountiful, doesn’t quite land, pointing out the obvious or to make a reference to something that seems out of place. One of the highlights has to be the voice talent. The film’s main trio characters of Bo the donkey, Dave the dove, and Ruth the sheep are played up as you would expect them to be in a kid’s animated feature, providing enough comical beats and poignant moments for each one to shine in their own way, shape, or form to impact the main narrative story at hand. Of the three, Keegan-Michael Key was the standout, voicing the fast-talking winged dove character of Dave. He hits all the right comedic beats and delivers the fast jokes left and right throughout the feature. Behind him is Steven Yeun who does the voice for the film’s true unsung hero character Bo the donkey. Yeun gives Bo enough endearing qualities to make him likeable and feels like a good, wholesome character to root for throughout the film. Lastly, Aidy Bryant provides the voice for Ruth and, while she does a good job in the voicing her, the character itself is not that interesting. Still, Bryant’s voice work for Ruth helps the character be more likeable, despite the character just being a cog in the film’s narrative machine. Secondary characters are the three wise-cracking camels (Felix, Cyrus, and Deborah), acting as the “three wise men”. Tracy Morgan as Felix, Tyler Perry as Cyrus, and Oprah Winfrey as Deborah, are solid and bring the most laughs to the proceedings. While not as vitally importance as Bo, Dave, and Ruth to the film, their inclusion is a humorous one. Other noteworthy performances were by Ving Rhames and Gabriel Iglesias as the two dogs Thaddeus and Rufus, Kristin Chenoweth as Abby the mouse, Kelly Clarkson as Leah the horse, Patricia Heaton as Edith the cow, and Anthony Anderson as Zach the Goat. Other supporting human characters included Gina Rodriguez and Zachary Levi as Mary and Joseph, the two iconic biblical characters within this Nativity story. While both are vital to the story (both in Christianity and in the movie), their character’s traits / personas are generic and aren’t that quite developed. However, Rodriguez and Levi help elevate Mary and Joseph to be somewhat memorable in their roles by the way of their voice work. Lastly, while he’s only in one scene in the movie, legendary seasoned actor Christopher Plummer (The Sound of Music and A Beautiful Mind) provides the voice for King Herod. 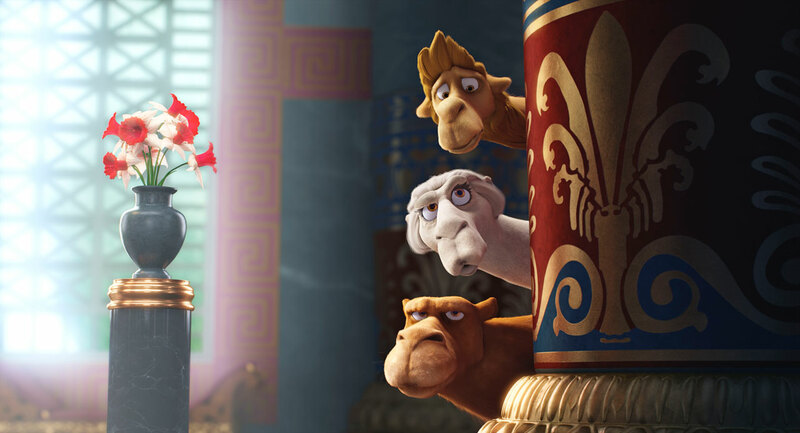 Bo, Dave, Ruth, and several other animal characters help make the Nativity of Jesus a reality in the animated movie The Star. This animated feature film is the newest iteration of the famous event in Christianity, presenting a new (and colorful) perspective to the well-known story of Jesus’s birth. While it does take liberties with its source material and limits its target demographic, the film offers up a cute and humorous religious-based animated adventure, thanks to its widely known voice actors. It wasn’t the absolute best and wouldn’t beat out any recent big animated hits from the likes of Disney, Pixar, or Illumination Entertainment, but it was still a wholesome kid-friendly feature that has its own charm to go along with it. Thus, it’s an iffy-choice as it may not be on everyone’s “must see” viewing list, but it is still worth recommending it for some, especially within religious circles. Will this movie be destined to join the ranks of other classic Christmas movies? Probably not. However, The Star is still a lighthearted film that’s a great way for young kids to be introduced to the story of the Nativity of Jesus through the eyes of various wisecracking animals and a lively Christian-Christmas soundtrack.